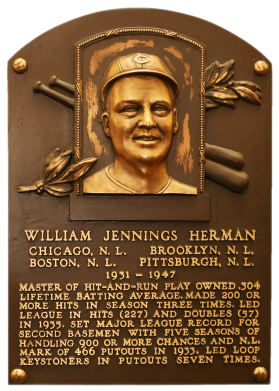 A 10-time All-Star, Herman's 227 hits and 57 doubles in 1935 were tops in the NL. The best defensive second baseman in the loop, he hit .300 or better eight times in his career. After playing most of his career for the Chicago Cubs, in 1941 he was traded to Brooklyn, prompting Dodger owner and fellow Hall of Famer Larry MacPhail to pronounce, accurately, "I just bought a pennant." Herman had a career .304 batting average and 486 doubles. 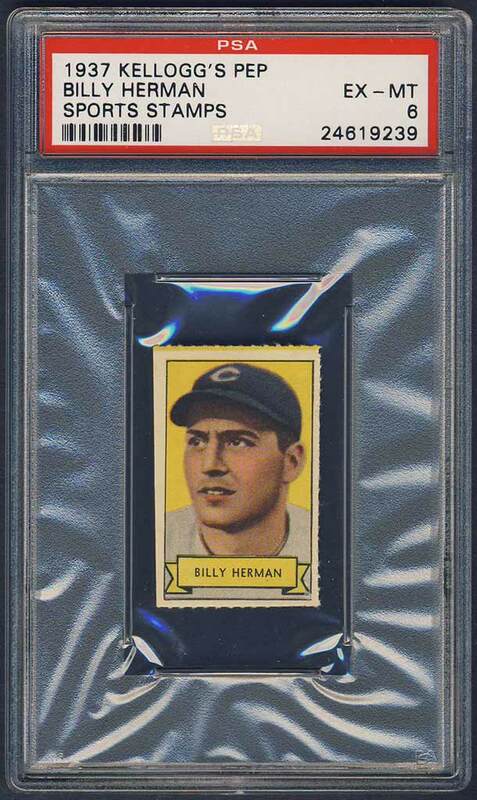 Comments: In September, 2002 I purchased a 1973 TCMA tribute card of Billy Herman . 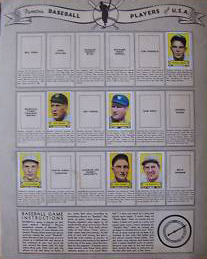 The set commemorates the 1941 Dodgers. It was a full portrait - nice picture. 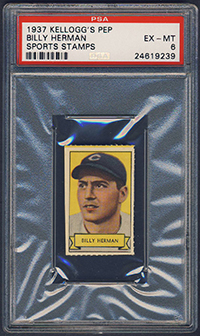 For several years I looked to find a portrait card issued contemporary to Hermans career and it was a struggle. 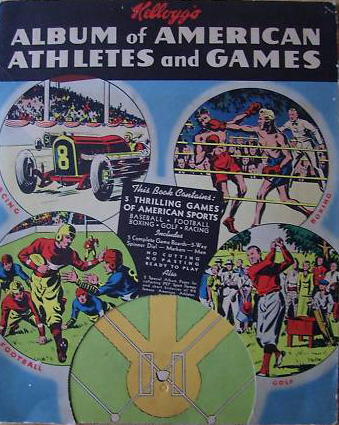 I remember buying a 1940 Wheaties card but I didn't really like the issue when I had it in hand. Then, I picked up a 1932 Orbit Gum Pin in July, 2008 in an eBay auction from seller Kris Keppler but really didn't like that either. Finally, in December, 2009 a card I had never seen before came up on eBay. I snatched it up. 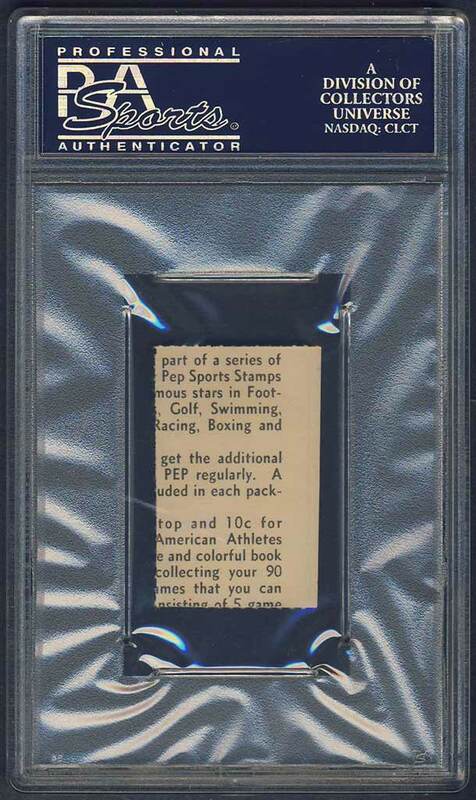 It was a 1937 Kelloggs Pep Stamps SGC 50 - pedigreed "from the Hull Collection" by SGC. It was a nice card - appearing NM/MT with a slight wrinkle on one of the stamps. I looked and looked for an upgrade and absolutely nothing surfaced. 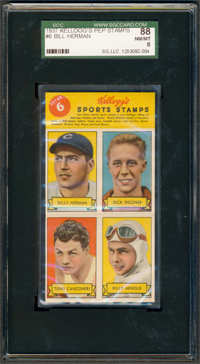 In March, 2012 a group of 15 different complete panels all graded by SGC came up in a Legendary Auction. Most of the cards were low to mid grade, with a couple EX/MT examples and a single SGC 88 of Herman/Degener/Canzoneri/Arnold. I placed a bid in the early days to ensure I could participate in the final day of the event. As the auction went into extra innings I placed a couple bids based on what was a fair price for the group. I hesitated for about ten more minutes considering whether I wanted to put one more bid in. I thought "one more"….and it worked. I waited to watch the closing seconds tick off. I won. The Herman is the highest graded example and an amazing upgrade. 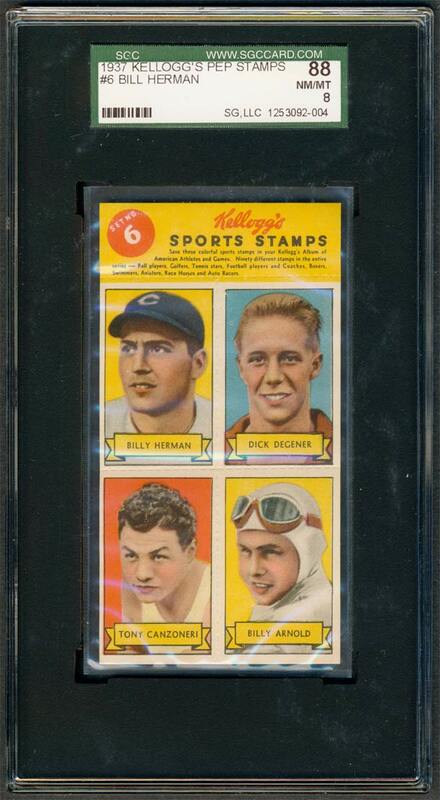 The next step - sell off the SGC 50 example and the rest of the panels won in the auction as singles (stay tuned). Hopefully the sales will cover what I paid for the whole group allowing me to keep the Herman FREE! UPDATE: It's March, 2014, and the final numbers are in on the Kelloggs sale. I sold off lots of singles on my own and ended up consigning the rest. It's all said and done now at $1461! I paid $1637.48 (including $83.98 for the SGC 50 Herman card). So, the SGC 88 Herman winded up costing me $176.48! Not horrible, not great. 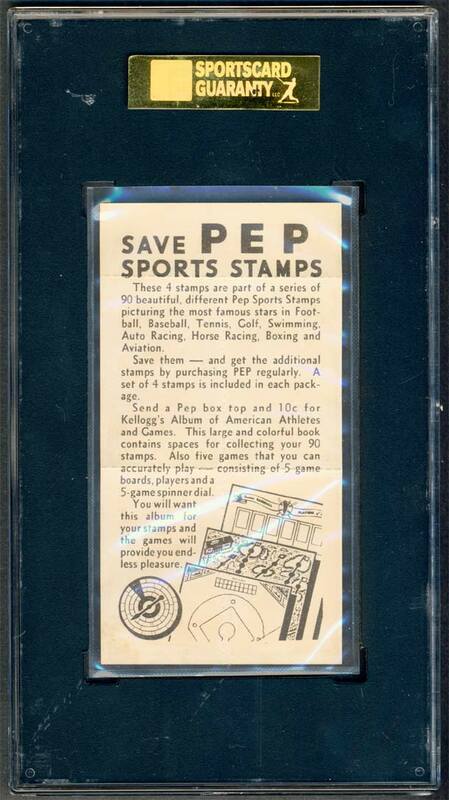 Description: Kellogg's packaged a four-stamp panel of "Sports Stamps" in boxes of Pep cereal. While 24 panles comprise a complete set, six of the stamps were double-printed, creating a set of 90. Backs of the stamp panels gave details for ordering an album and game boards for playing with the stamps. The color-tinted stamps measure 1-1/8" X 2-3/4" individually, and 2-1/4" X 4-1/4" as a panel. 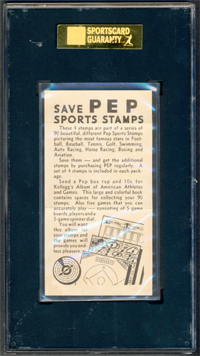 Besides the ballplayers, the Kellogg's Pep stamps included football, tennis and golf players, swimmers, boxers, aviators and race horses. Finding panels intact can be a challenge.